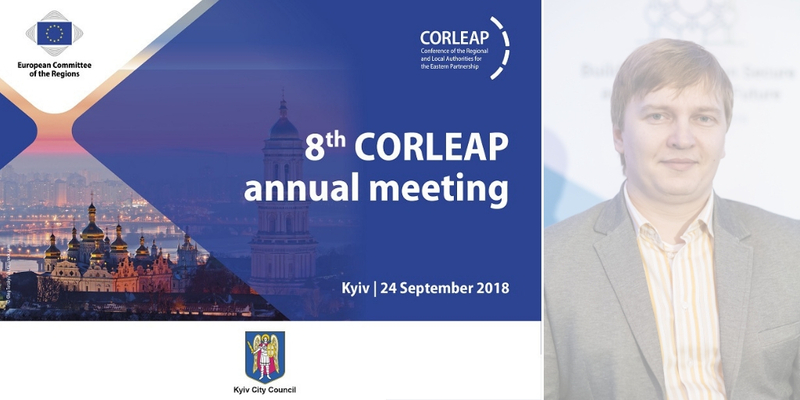 On Monday, 24 September Eastern Partnership Civil Society Forum (EaP CSF) contributed to the Conference of the Regional and Local Authorities for the Eastern Partnership (CORLEAP) 8th Annual Meeting in Kyiv, Ukraine. The Meeting opened with remarks from co-chairs, Markku Markkula, First Vice-President of the European Committee of the Regions (CoR) and Volodymyr Prokopiv, Head of Kyiv City Council, which hosted the event. Speaking on behalf of the Steering Committee, and as EaP CSF Ukraine Country Facilitator, Hennadiy Maksak addressed the Meeting’s agenda, drawing attention to disinformation and EU assistance to local and regional authorities in the EaP region. We are “halfway way in reaching the milestone year 2020 – ’20 deliverables for 2020′“, started Maksak. There are many success stories from the region, especially in trade, environment and energy efficiency, but there are new challenges, which still need to be addressed at policy level. EaP needs to provide a more robust response to new challenges, such as disinformation and state capture. This is also true for conflict areas and arising security issues.This can only be done with “greater engagement of citizens and that is where civil society needs to step up its efforts”, concluded Maksak. EaP is the preferred option, and cannot be weighed against a more “neutral” approach. In this light, the recent discussions around the Neighbourhood, Development, and International Cooperation Instrument (NDICI) are worrying, especially for partners in the EaP region. Grouping EU’s external action instruments under one roof “sends a strong signal to EaP partner countries and societies that they are not a special category of partners who are helping to secure EU’s vital interests”, warned Maksak. Moving on to country case studies, Maksak mentioned Armenia: “EU should support the efforts of Armenian government, especially in the areas relevant to the Comprehensive and Enhanced Partnership Agreement (CEPA) implementation”. While there is less optimism about Belarus, we can see progress, especially in people-to-people contacts. It is Moldova that presents challenges, as little work has been made on implementing EU-Moldova Association Agreement – Deep and Comprehensive Free Trade Area (AA/DCFTA). While welcomed, suspension of EU bilateral macro-financial assistance is unprecedented, an unresolved issue that lingers on from last Summer’s Chisinau mayoral elections. While praising changes in Ukraine, Maksak was quick to highlight issues in regions affected by war and precarious situation of social activists in the country. It is especially on that first issue that EaP-CORLEAP could work together, he added. There are various activities where we can see synergies – suggesting signing a “memorandum between EaP CSF and CORLEAP, particularly in the areas where joint efforts may be applied”, said Maksak. This includes previously “unexplored” areas for cooperation, such as disinformation. The speech also included appeals: one addressed to Parliamentary Assembly of the Council of Europe (PACE), concerning a change of rules, undermining sanctions and possibly allowing for the return of the Russian Delegation to the Assembly – as well as another, warning against members of regional governments and assemblies visiting occupied territories. The next CORLEAP Annual Meeting is due to be held in Yerevan, Armenia.